Tests are one of the building blocks of your courses. Use them to ask the learner a number of questions to assess their understanding of the course material. drag and drop the corresponding element from the toolbar on the left to the desired position within the test. This will open the configuration window that enables you to construct your question. Once a question has been added, you can change its position within the test, or delete it. hold and drag the question up or down to the desired position. You can assign one or more tags to each question within a test. The percentage of correctly answered questions with each tag is tracked in Courselle statistics. You can, for example, tag all questions concerning a particular topic with a unique tag, then track what percentage of questions with a given tag is answered correctly. If questions with a particular tag demonstrate a consistently low rate of correct answers, it may indicate that the material is too hard, poorly explained, or that the questions are constructed incorrectly. open the question for editing, type the tag name in the Tags field, then press the Enter key. You can assign multiple tags to a single question. To remove a tag from a question, open the question for editing, locate the tag you want to remove, and click the cross icon next to the tag's name. Type in a title and a description for the test. Both the title and the description are visible to learners who are about to take the test. Specify the maximum number of attempts. Learners who make the specified number of attempts and still fail to pass the test will be unable to take the test again. Specify a time limit. Learners who take longer than the specified amount of time to finish the test will have all unanswered questions marked as answered incorrectly. Enable question shuffling. This option makes it so that the questions within the test are presented in a random order. Forbid skipping questions. By default, learners can skip questions without answering them. 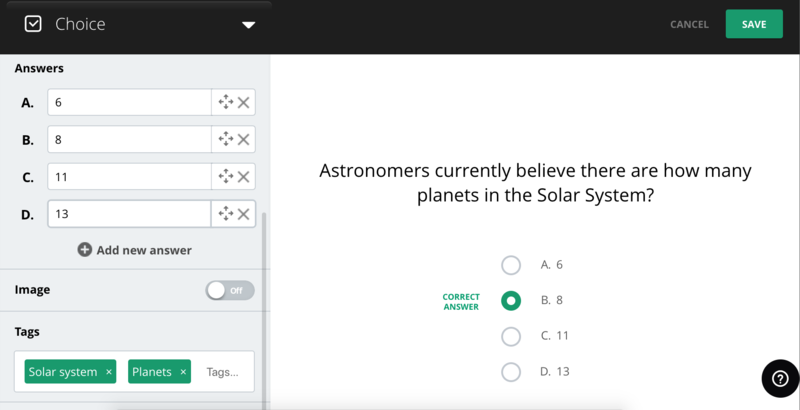 Enabling this option will make it so that learners have to answer a question before seeing the next one. Choose a number of questions to show in every attempt. Set the pass threshold. This value determines the percentage of questions in the test (from 0% to 100%) a learner has to answer correctly to pass the test. Once you have finished configuring the settings, click Save Changes to close the settings menu. If you are building online courses on a regular basis, the ability to import objects from earlier courses that have already proved their worth is a life saver. The “Question pool” feature which allows you to borrow questions from a different test in the same course - or from a different course entirely. click the “Copy Questions” button or the “copy from existing tests” link to see the list of all courses together with all tests included within. The number next to a test indicates the number of questions inside. Having selected the desired test, you proceed to the question selection screen. To make picking the right question even more intuitive, we display icons indicating the question’s type next to its title. You can select multiple questions at a time by marking the corresponding checkboxes. What if you’ve been really busy and created dozens - even hundreds of courses and tests? Fear not. In this case, global search comes to the rescue. Type in a word or phrase into the question pool search field, and Courselle will list all tests that have that word or phrase in the title. When you have finished editing the test, it is time to see how it would look in the course. click the eye icon. If you are satisfied with the test, it is time to exit the test editor. click the cross icon. All changes you made to the test will be saved automatically. The success transition indicates to which course element learners are taken if they get over the test's pass threshold. The failure transition indicates to which course element element learners are taken if the test result is under the pass threshold. Both success and failure transitions can lead to any other course element. They can lead to two different elements, or to the same element. Note that you can have the failure transition lead to the previous course element. This way, for example, you can present some information on a page, and then ask the learner a question based on that information. If they answer incorrectly, you can take them back to the original page to review the material before answering again.